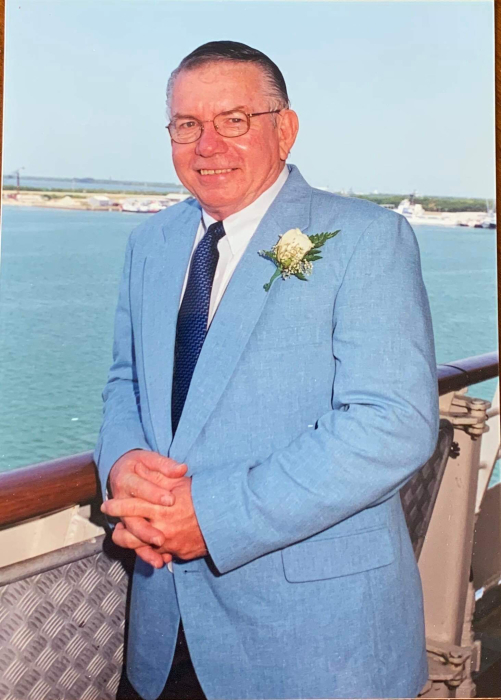 John Badaczewski, Jr., 76, went home to be with the Lord in Orwigsburg, PA, on November 22nd. John was Head of the Math Dept. at Arch Bishop Carroll High School in Washington, D.C. He was named "Teacher of the Year" in 2000. John said being so named "is the ultimate of my career as a teacher." John was also an assistant football coach for Carroll. He was inducted in the Hall of Honor on June 11, 2007 at the John F. Kennedy Center for the Performing Arts. He was also inducted into the Athletic Hall of Fame at Arch Bishop Carroll High School in 2012. His father, who bore the same name, played guard for the Redskins when the family moved to Washington D. C. from PA decades ago. John retired in 2007 after teaching at Carroll for 41 years. He enjoyed his retirement with his wife, Joan, in "The Villages", Florida. They moved to PA 8 months ago to be close to his children & grandchildren. In addition to his father, and mother, Betty (Phenicie) Badaczewski, he was also preceded in death by his son, Christopher on October 18, 1993, and his sister, Mary Musgrove on April 9, 2018. In addition to his wife, he is also survived by his daughter, Cara Lynne Risher, two grandchildren: Chris & Marilyn, sister, Patricia Latora, brother, Bob Badaczewski, his niece Candice Wilson, step-daughter, Melody Morris, step-son, Edward Maiolatesi, nieces and nephews and cousins. A private mass will be conducted at the family's convenience.